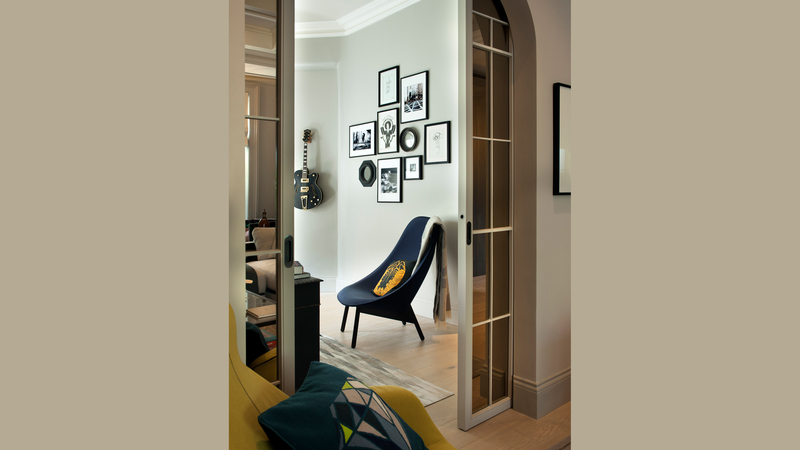 TG-Studio was approached by the client, Rhys Cole, to join two apartments in a South Kensington mansion block. He had lived in the basement apartment for some years and when a ground floor apartment above his apartment came up on the market Rhys saw an opportunity to join both units and double his living space. His current apartment had become too small for him and his girlfriend and staying in the area was a lifestyle choice. 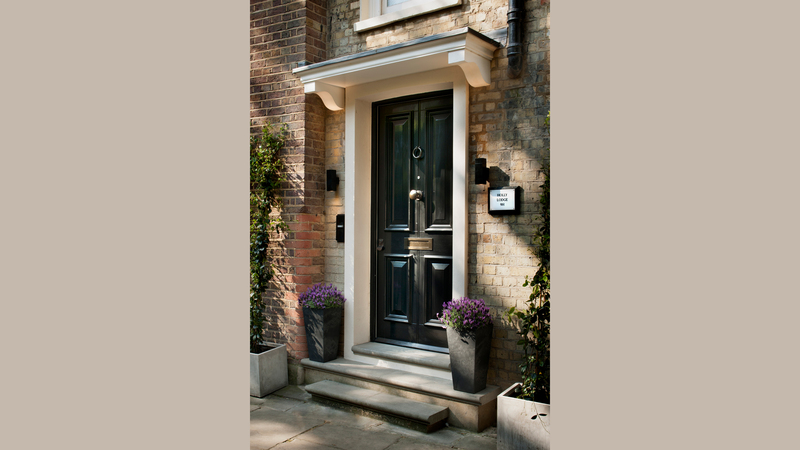 The ground floor apartment had its own entrance off a pedestrian cobbled mews in addition to being accessed off the common parts of the block. He knew this conversion needed permission from the planning authority, the conservation officer of the borough and also the residents association of the block. In addition he needed a clever design to introduce a staircase between the units and create the grandeur this much bigger unit deserved. He researched several architects and designers and selected TG-Studio. The lower ground floor and upper ground floor apartments both consisted of a living room / dining / kitchen and two bedrooms joining a bathroom. 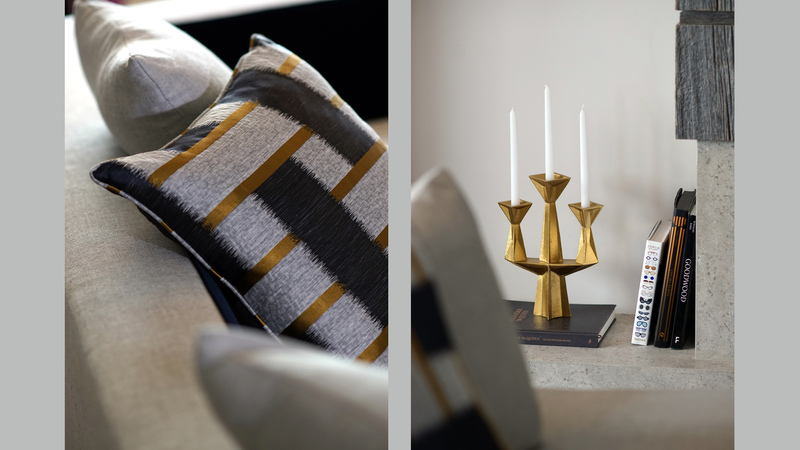 TG-Studio presented a design that split the two floors into an entertaining floor approached by a double height entrance hall accessed from the picturesque Thistle Grove and an accommodation floor connected to the upstairs through a private staircase. The double height entrance lobby invites one to climb the 6 steps to the upper ground floor. The mirror on the left of the entrance is called’ Origami by Thomas Griem at TG-Studio. 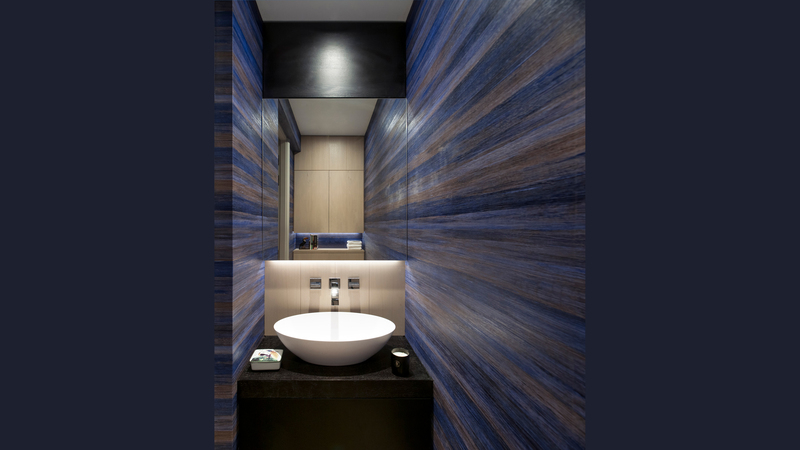 The wallpaper is silk woven with metal pleats by Stereo. The stairs are framed by an oak portal allowing to incorporate low level lighting. 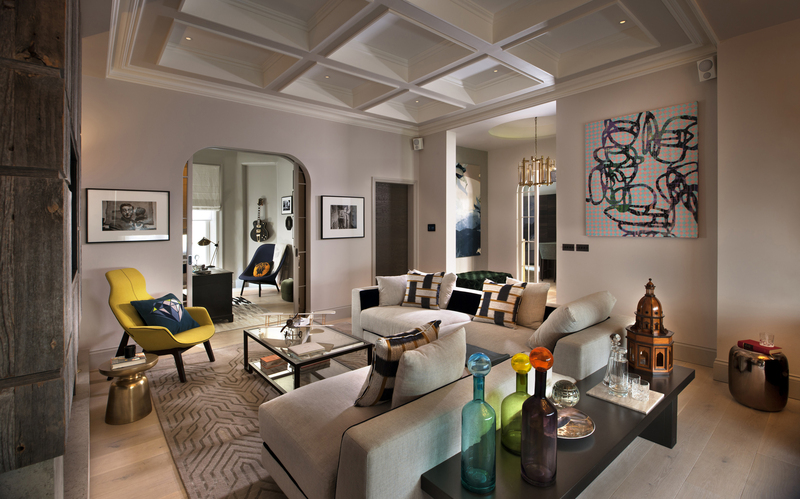 Within the circular ceiling recess is a chandelier by RV Astley. The sculpture is by Carol Peace. The staircase leads to an upper hall and the nearly entirely open plan entertaining area. To the right is the kitchen and dining space and to the left the living room. A feature pair of sliding doors leads to the study and to a hallway leading to storage, a guest WC and access to the common parts. The central feature is the fireplace which consists of a base of beige limestone called Guido blue from Natural Stone Projects. Above the stone are storage units clad with wood obtained from an old barn in Transylvania. 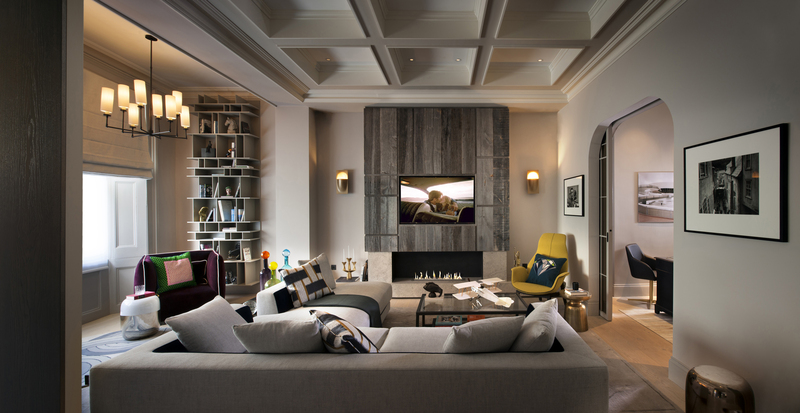 The TV is flush recessed into this elevation. Parts of the kitchen had a coffered ceiling, we liked that detail very much and introduced it into living room, kitchen and dining room. It shows off the high ceilings and connects the interior to the age of the building. 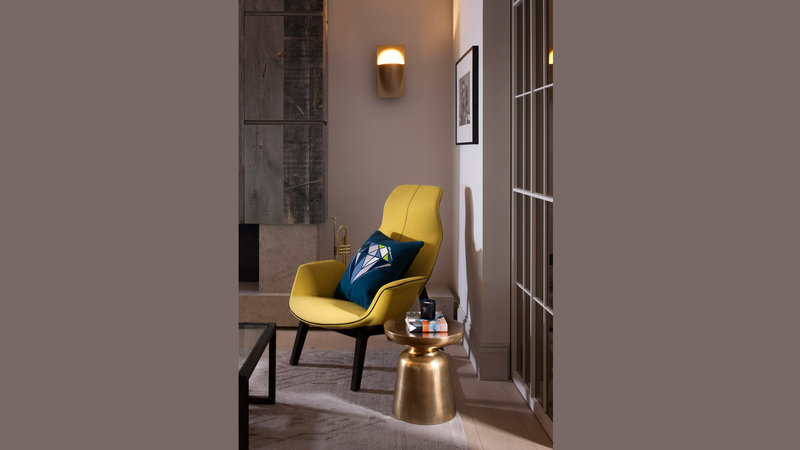 The wall lights are Bertrand Balas Balance Lamps from the 1970s purchased in a gallery in Amsterdam. The sofa is called Nest, designed by Thomas Griem, and available through Alter London. It is covered in two fabrics in this project. The bookcases are from BoConcept and the armchair from Poliform. The view from the kitchen towards the upper hall and living room shows the open feel of this space. We have used the same design of fixed panels in this opening than the sliding doors in the living room. The sculpture is by Carol Peace. 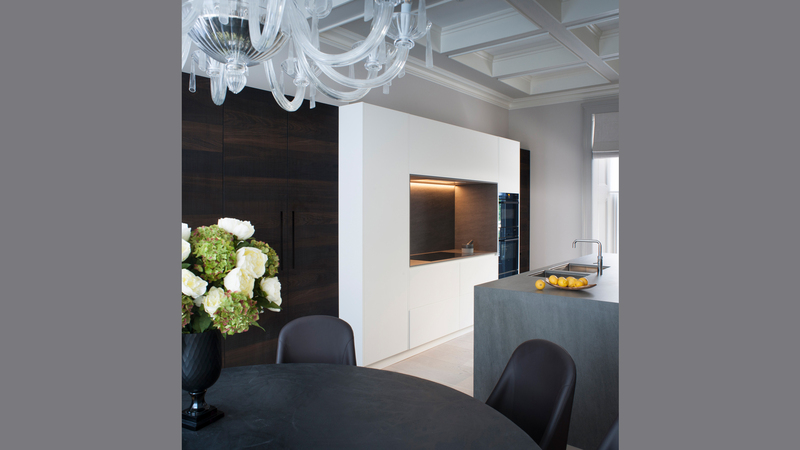 The kitchen is manufactured in Spain by DOCA distributed and designed by Gemini Design in London. It consists of a long tall run of units in matt white and sawn walnut. The cooking niche is cut out of the white units and framed in a basalt stone. In front of the tall units is a 3.5m island unit, looking like a block of basalt and accommodating sinks, dishwasher etc. 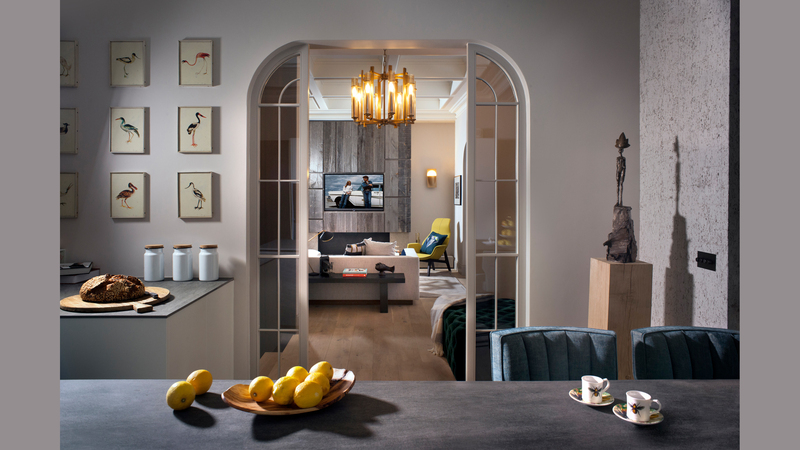 The run of tall units runs into the dining area and accommodates a bespoke bar than can be hidden when required. This bespoke area holds wine fridge, wine storage glasses etc. 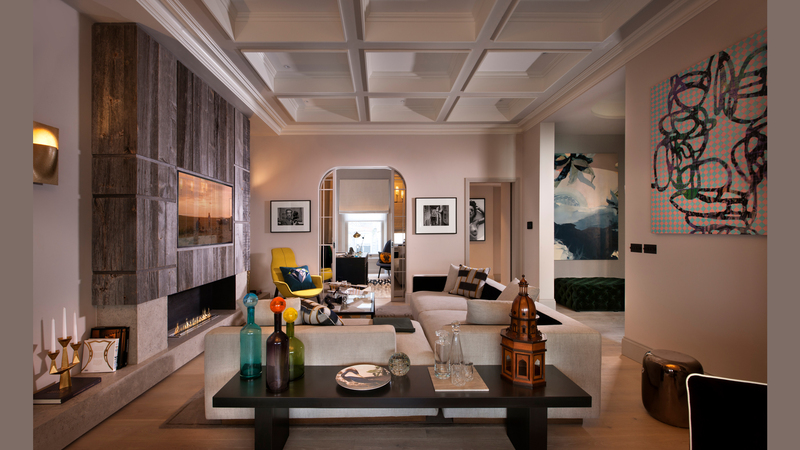 The kitchen ceiling, as the living room ceiling, features the coffered detail which sets it visually apart from the rest of the right hand space the dining area. The thick structural wall opposite the dining table is covered with a cork and metal leaf wall paper by Elitis. The circular table is in a cast resin finish that looks like concrete by Desalto, the chairs are leather upholstered from SMA Mobilli. The Venetian chandelier is from RV Astley. 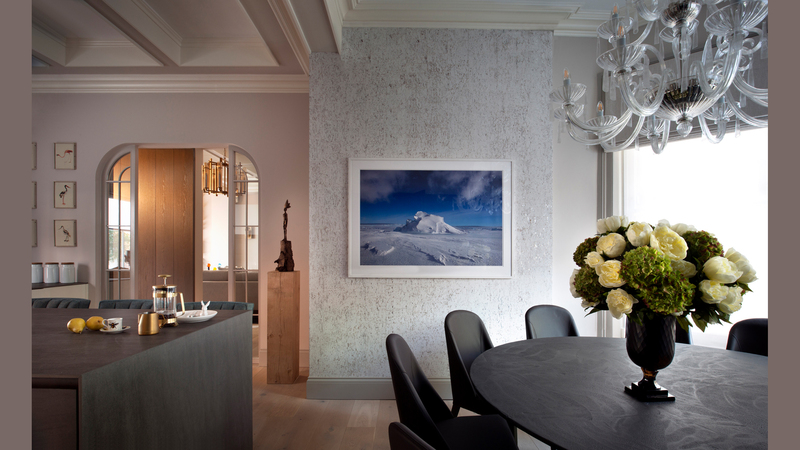 Next to the bronze sculpture from Carol Peace is a photograph of the Antarctic by Angus McDonald. In the guest WC, a bespoke basin solution shows an Agape sink supported on a walnut base with Dornbracht MEM taps, LED feature lighting below the mirror. The wallpaper is from Elitis and is based on banana tree leaves. Calm colours are injected with sophisticated orange in the velvet of the armchair and the scarf in the art piece above. The cushion on the bed (The Rug Company) and the original feather art on the wall reflect the orange peel feel. 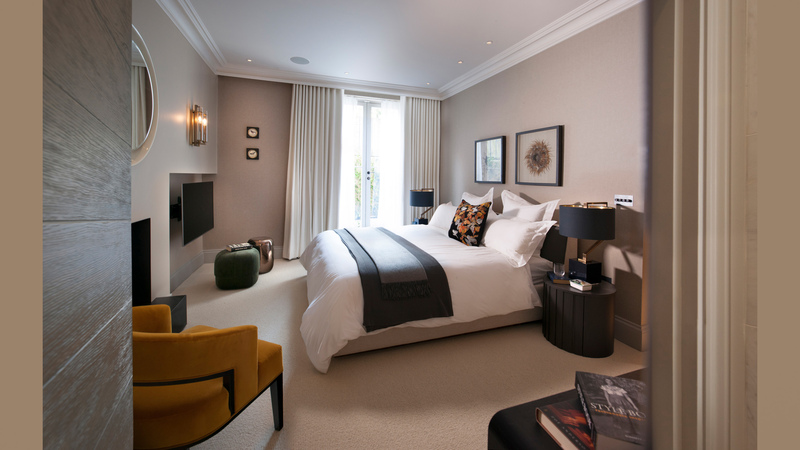 The bedside tables are “Elvis” from Fimes, The wall lights above the niche are from RV Astley , the table is from Camerich and the armchair from Alter London. The fabric is from Amy Somervile “Saffron” velvet. 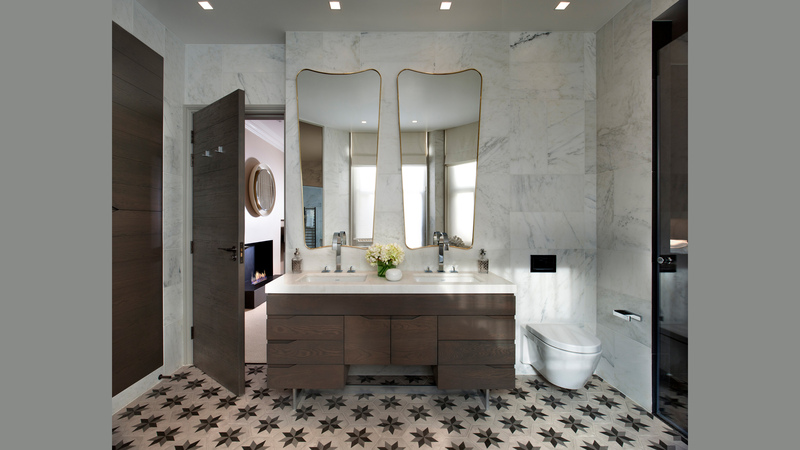 The master bathroom in layout offers a freestanding bath, a walk in shower and a double sink. The design is a mixture of classic and eclectic. The classic elements are the Carrara marble on the walls and the flamed granite Nero assoluto in the shower. The eclectic mix is achieved by using Italian floor tiling inspired by original Victorian tiles, two antique mirrors from the 1950 found in a gallery in Paris and the bespoke joinery piece made by the contractor Amirilan. The doors throughout the house are covered in thick oak veneer to resemble floorboards. 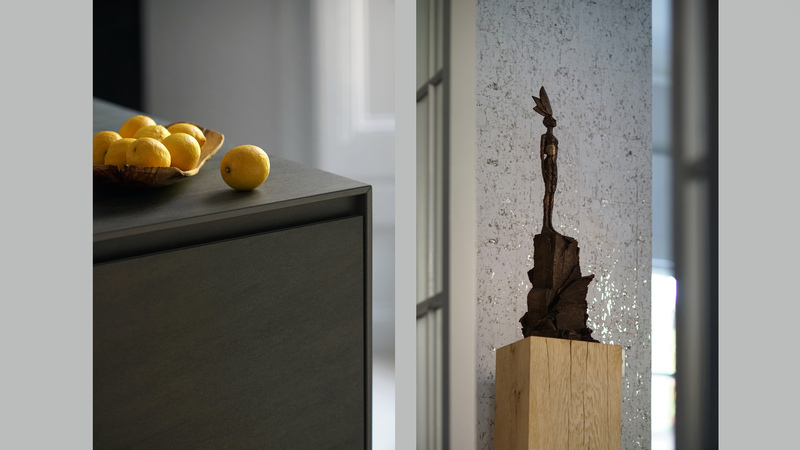 The handle is by Olivari in super anthracite finish. In the walk in wardrobe, the panels are in a wallpaper from Elitis through Abbott & Boyd called Luminescent Vega. The handles on the doors and draws are from Olivari. The mirror above the dressing unit makes the room appear twice as large as it is.